A year after leaving his studies at Temple University in 1953, Charlie Hayden worked as a mate for fishing luminaries such as Red Stuart and Tommy Gifford out of Miami Beach’s Chamber of Commerce docks. Hayden soon became one of the area’s most sought-after mates-- fishing the who’s who of the Atlantic sport-fishing fleet in Bimini, Cat Cay, Ocean City, Oregon Inlet and Montauk. 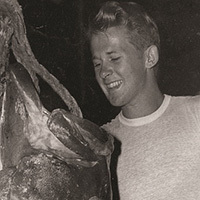 In the mid-1960s Hayden developed a reputation as a bait-rigging specialist with his perfect presentation of split-tail mullet to the giant tuna migrating through the Bahamas. In 1973 he spent 16 weeks in Australia, running Garrick Agnew’s 53-foot boat and catching 83 black marlin in 16 days--some weighing over 1,000 pounds. But in the 1980s, Hayden returned to his first love--working the chair and rigging baits. He became big-game fishing’s main bait supplier-- the first to air-freight coolers of bait worldwide to traveling crews.